PAUL JAY, SENIOR EDITOR: ElBaradei, is the head of the International Atomic Energy Agency, stated quite definitively there is no evidence of a nuclear weapons program in Iran. The recent resolution—the Kyle-Lieberman amendment—and the recent U.S. sanctions against Iran, which one of the charges is that Iran has been helping what they call insurgents in Iraq. There's practically no evidence of that either. Based on what we know as evidence, there's not a lot of reasons for U.S. policy to be as aggressive right now towards Iran as it is, certainly not for the stated reason. What really does motivate U.S. policy towards Iran? - Monday, June 1, 2009 The Coming Wars by Seymour M. Hersh - What the Pentagon can now do in secret - http://chagataikhan.blogspot.com/2009/06/coming-wars-by-seymour-m-hersh.html . And during his rule, incidentally, the United States was strongly supporting the same programs they're objecting to today. In 1979, the population overthrew the dictator, and since then the United States has been essentially torturing Iran. First it tried a military coup. Then it supported Saddam Hussein during Iraq's invasion of Iran, which killed hundreds of thousands of people. Then, after that was over, the United States started imposing harsh sanctions on Iran. And now it's escalating that. The point is: Iran is out of control. You know, it's supposed to be a U.S.-client state, as it was under the Shah, and it's refusing to play that role. JAY: The sanctions that were just issued recently [are] the beginnings of a kind of act of war, this ratcheting up of the rhetoric right at a time when the IAEA is saying, in fact, Iran's cooperating in the process. But it's all coming down to this question of does Iran even have its right to enrich uranium for civilian nuclear, which in fact it has, under the non-proliferation treaty. But Bush in his last press conference, where he had his famous World War III warning, has said even the knowledge of having nuclear weapons we won't permit, never mind a civilian program. This puts U.S. policy on a collision course with the IAEA, with international law. CHOMSKY: Just a couple of years ago, from 2004 through 2006, Iran did agree to suspend all uranium enrichment, halt even what everyone agrees they're legally entitled to. That was an agreement with the European Union. They agreed to suspend all uranium enrichment. And in return, the European Union was to provide what were called full guarantees on security issues—that means getting the United States to call off its threats to attack and destroy Iran. Well, the European Union didn't live up to its obligation, [as] they couldn't get the U.S. to stop it. So the Iranians then also pulled out and began to return to uranium enrichment. The way that's described here is-- the Iranians broke the agreement. JAY: The experts are saying, including ElBaradei and others, that if you can enrich uranium to something just under 5%, which is apparently what's needed for civilian purposes, you're most of the way there towards the technology of having a bomb, that once you have that enrichment technology, you're not that much further towards a bomb. CHOMSKY: Yeah, but that's true of every developed country in the world. Why pick out Iran? It's true of Japan, it's true of Brazil, it's true of Egypt. And in fact, one could say—here I tend to agree with the Bush administration. In the non-proliferation treaty, there's an article, Article 4, which says that countries signing the NPT are allowed to develop nuclear energy. Well, okay, that made some sense in 1970, but by now technology has developed enough so that it has reached the point that you describe. When you've developed nuclear energy, you're not that far from nuclear weapons. So, yeah, I think something should be done about that. But that has nothing special to do with Iran. In fact, it's a much more serious problem for those nuclear weapons states who are obligated under that same treaty to make good faith efforts to eliminate nuclear weapons altogether. And, in fact, there are some solutions to that. ElBaradei had proposed a couple of years ago that no states should develop weapons-grade materials: all high enrichment should be done by an international agency, maybe the IAEA or something else, and then countries should apply to it. If they want enriched uranium for nuclear energy, the international agency should determine whether they're doing it for peaceful means. As far as I'm aware, there's only one country that formally agreed to ElBaradei's proposal. That was Iran. And there's more. I mean, there's an international treaty, called the Fissban, to ban production of fissile materials except under international control. The United States has been strongly opposed to that, to a verifiable treaty. Nevertheless, it did come to the General Assembly, the U.N. Disarmament Commission in the General Assembly, which overwhelmingly voted in favour of it. The disarmament commission vote was, I think, 147 to 1, the United States being the 1. Unless a verifiable fissile materials treaty is passed and implemented, the world very well may move towards nuclear disaster. JAY: Do you think we're actually moving towards a military confrontation? Or are we seeing a game of brinksmanship? 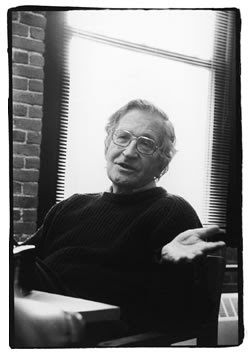 CHOMSKY: Well, whether purposely or not, yes, we're moving towards a military confrontation. PAUL JAY, SENIOR EDITOR: The vote over the Kyle-Lieberman amendment, the Senate resolution to declare the Iranian Revolutionary Guard a terrorist organization, essentially was followed up on by the administration when they did declare the Revolutionary Guard a terrorist organization and issued sanctions against three major Iranian banks. The reaction in the Democratic Party was interesting, Senator Clinton being the only presidential candidate in the Senate that voted for the resolution. All the other candidates both in and out of the Senate opposed it—quite a significant split, I would say, with Joe Biden and Senator Webb, who were very, very vocal, vocally against the resolution. What do you make of what this next Democratic, well, I should say, between now and the election, the leadership of the Democratic Party? And if we are looking at Senator Clinton as the next president, which if all things remain the same we probably are, what do you make of the Democratic Party and Iran? NOAM CHOMSKY, PROFESSOR OF LINGUISTICS, MIT: The Democratic Party is somewhere in between the administration and overwhelming world opinion. I mean, the world is just appalled at the thought that the United States might invade Iran, attack Iran. Now, even in the region, you know, where the countries don't like Iran at all—Turkey, Saudi Arabia, and Pakistan hostile to Iran in many ways—but, nevertheless, the population in the region, which has been polled, prefers Iran to have nuclear weapons than to having any war, even though they definitely don't want Iran to have nuclear weapons. When you go beyond, opposition is simply overwhelming. In fact, you can't find any corner of the world, I think, outside of Israel where there's any support for the U.S. policies. In fact, the American population is overwhelmingly opposed. About 75% of the population—at least a few months ago, before the huge propaganda offensive—75% of the population was against any threats against Iran. So the Democratic Party is sort of hovering in between almost universal world opposition to even the threats of war. JAY: There seems to be a division amongst at least the leadership of the Democratic Party on this question. Webb, Biden on one side and some others, certainly, you know, Edwards, Obama, Kucinich, Gravel. But in terms of leadership there seems to be a serious split with Senator Clinton signing on to this resolution. CHOMSKY: There's a split between Gravel, Kucinich, and others like them and the rest of the Democratic Party, and then there's a split between them and the extreme hawks like Lieberman. But the question is one of degree. I mean, every viable candidate—I'm not talking about Gravel and Kucinich or Ron Paul—every viable candidate has said we have to keep the options open, meaning they are continuing the threats of military action against Iran. I don't know if anybody cares, but there is something called the U.N. Charter, which is a valid treaty that we're committed to which bars the threat or use of force. So they're all in violation of the Charter and they don't seem to care. The media don't seem to care. I mean, the media and the political class are isolated from both world opinion and even domestic opinion. And, yes, there are some variations within the Democratic Party over this as to how extreme they are. But its, all, almost all of it is just kind of like off the wall from an international point of view, except for people like Gravel and Kucinich.